BHUBANESWAR, India, Jul 1 2011 (IPS) - In eastern Orissa state’s tribal hinterlands about 200 ‘seed-mothers’ are on mission mode – identifying, collecting and conserving traditional seed varieties and motivating farming families to use them. The seed-mothers (bihana-maa in the local dialect) from the Koya and Kondh tribal communities have reached 1,500 families in the Malkangiri and Kandhamal districts and are still counting. These women are formidable storehouses of knowledge on indigenous seeds and biodiversity conservation. Collecting, multiplying and distributing through exchange local varieties of paddy, millet, legume, vegetables and leafy green seeds, the seed-mothers already have a solid base of 80 converted villages. As they spread their message through the hinterland, targeting another 140 villages, the women also promote zero dependence on chemical fertilisers and pesticides. Considering that Malkangiri is Orissa’s least developed district, with literacy at a low 50 percent and isolated by rivers, forests, undulating topography and poor connectivity, the achievement of the seed-mothers is admirable. The struggles of Malkangiri farmers with climate change is visible in the Gudumpadar village where seed-mothers are passionately reviving agricultural heritage and convincing the community to stay with local seeds and bio-fertilisers and pesticides. “This is the best way to cope with erratic rainfall, ensure the children are fed and avoid the clutches of moneylenders,” says 65-year-old seed-mother Kanamma Madkami of Kanjeli village, who has multiplied 29 varieties of local millet and paddy seeds. Mangu Adari, 35, who owns less than two hectares of rain-fed land, some of it on a hill slope, is one of the new converts to local seeds. Last monsoon he could cultivate paddy, millet, beans and pulses on only half his land due to late and heavy rains. This year he hopes to have a surplus to take to the market to sell for badly needed cash. “Local plants are products of centuries of adaptation to local climate and soil characteristics, hence, indigenous paddy holds out to drought for 30 days compared to 15 days by high-yield hybrid varieties,” explains Kusum Misra, coordinator in Orissa for Navdanya, a network of seed-keepers spread over 16 Indian states and supported by 54 community seed banks. Similarly paddy grown traditionally in the lowland can survive two weeks of water logging while highland paddy varieties yield quick harvests in just 60 days, compared to the 125 days for hybrid paddy, Misra said. Based in rice-rich Balasore district, Misra has collected and propagated more than 65- varieties of traditional paddy, including strains of aromatic rice, those with resistance to salinity (for coastal farming), floods and droughts and some with medicinal properties. The traditional varieties respond to natural fertilisers and pesticides; and if seeds are preserved properly the farmer actually has access to no-cost farming. 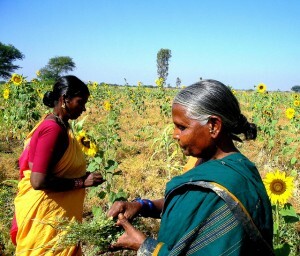 “When they own the seeds farmers can time the sowing or even resort to a second round of sowing if needed,” says Kanamma. “By keeping procurement prices for traditional varieties low the government discourages their farming; one reason being that rice millers prefer uniform sizes and varieties of paddy. Also, government hybrid seed outlets have sales targets to be met,” says Misra. Omprakash Rautaraya, chairperson of the Organisation for Rural Reconstruction and Integrated Social Service Activities, a non-profit responsible for reviving the concept of seed-mothers, says that methodical “seed mapping of local varieties and prioritising them on the basis of usage, cropping patterns and water requirement has made multi-cropping possible”. With a mix of six to 14 crops grown simultaneously, even during the frequent droughts, upland farms now harvest at least two crops. Seed-mothers need little more than a backyard patch to propagate seeds and supplement family nutrition. Kausalya Madakami of Malkangiri’s Manga village developed 57 varieties of food plants and exchanged them too. Annual community seed fairs, organised right after the monsoon harvest, help promote and exchange traditional seeds and knowledge. Here the seed-mothers cook and showcase various traditional items made from indigenous paddy and millet. Tribal women are re-learning the traditional ways of seed preservation from the seed-mothers. 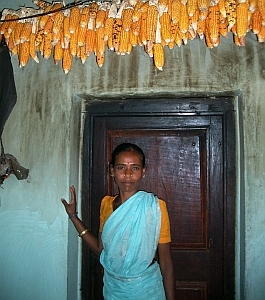 Vegetable seeds are smeared with wood ash, bitter begonia or neem leaf powder and stored in hollow bamboo poles while paddy and millet are safe in jute bags hung from rafters. Pre-sowing treatment may involve cow-dung and cow urine or the use of ivy gum as anti-fungal and pest repellant. Poor seed quality marketed by the government is a real worry. The government’s National Bank for Agriculture and Rural Development (NABARD) in a status report on seed development released in March carried data showing falling rice production in six eastern states, including Orissa – the rice bowl of the country. In Orissa, the seed germination rate for regular paddy is just 55 percent and may drop as low as 25 percent. According to the NABARD report, land under cultivation in the state is shrinking and poor quality seeds and increasing floods and droughts are making farming increasingly un-remunerative. Well-known environmental activist and founder of Navdanya, Vandana Shiva, told IPS that “climate resilient seeds in women’s hands are vital to climate security and corporations that have taken out some 1,600 patents on climate resilient seeds are biopirates”. “Allowing corporations to hijack and monopolise seed supply is a recipe for food insecurity and climate insecurity,” Shiva averred.